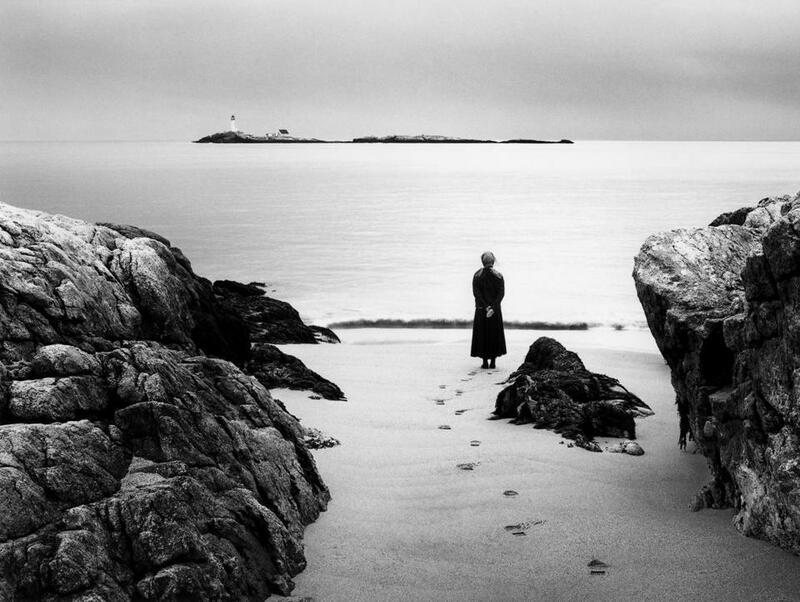 Photographer Alexandra de Steiguer’s self-portrait on Star Island, off the New Hampshire coast, looking toward the White Island Lighthouse. In early November, as she has done for the last 19 years, Maine photographer Alexandra de Steiguer will leave civilization behind. She will sail from Portsmouth Harbor to Star Island, one of nine that make up the Isles of Shoals, roughly 7 miles off the coasts of New Hampshire and Maine. There, she will keep watch over the buildings, grounds, and natural elements, living in solitude for the next five months as winter island caretaker. Ever since Captain John Smith first stepped foot here in 1614, the Shoals have been home to a range of activities and communities: stalwart fishing enclaves, grand 19th-century hotels, marine research facilities. Today, it hosts a summer camp, conferences, and retreats managed by the century-old nonprofit Star Island Corporation. De Steiguer — her name rhymes with “tiger” — has spent most of her life surrounded by water. At 18, she joined an ocean research education program in Gloucester, where she learned oceanography and basic marine biology. In 1991, she was a deck hand on the Ernestina, a 97-year-old schooner used as a floating classroom, when the ship was caught in what became known as “the perfect storm,” the product of Hurricane Grace churning up the East Coast to collide furiously with a second storm charging south. “We were too far out to avoid the worst of the wind,” de Steiguer said. “Sails were blowing out, and huge waves hammered us. A lot of water washed over us. We were clipped to safety lines fore and aft to move around the deck.” The Ernestina held together, unlike three other boats caught in the maelstrom, and outraced the brunt of the deadly storm to find safety in Bermuda. Like Thoreau, she pares life down to the essentials. “It makes you realize how much of what we do is inconsequential. Surrounded by the vastness of sea and sky, you realize the bigger picture, in which we are less important than we like to think,” she said. And she takes photographs — with a film camera, meaning she has to wait until spring to see her results. An accomplished photographer, though self-taught, she tends to wait for inspiration. “Hunting for things to photograph is not how I like to work. I simply am a human ready to make images,” she said. De Steiguer received a commission from the Peabody-Essex Museum and the North Carolina Museum of Art for the Childe Hassam exhibit, running in Salem through Nov. 6. Her prints show striking, contemporary views of Appledore Island, where Hassam painted on and off for three decades. In a place where clocks don’t matter and sunrises and sunsets are the reliable measure of a day’s limits, time takes on a different meaning. “My concept of time is like a wave where the days and seasons, like particles of water, lift up and around, repeating in a circular motion,” de Steiguer said. Robert Pushkar can be reached at robertgpushkar@gmail.com.